During the past six months we have been closely monitoring the development of the Mirai botnet and its connections with the Israeli stress testing service vdos-s.com. As already reported in January, Mirai was originally written by two members of Protraf, a hosting company not only specialized in protecting Minecraft servers but also engaged in all sorts of underground battles with competitors including launching denial of service attacks and routing hijacks. During months we wondered what was the connection of Josiah White (Bashlite, Qbot) and Paras Jha (Anna-Senpai. Dreadiscool) and the largest botnet using Mirai. This very active botnet that later on became publicly known as “Botnet #14” was operated by someone that seemed to have close connections with the code owners but with the freedom of choosing its own targets. Botnet #14 used the domain mufoscam.org as one of the earliest placeholders for the command and control. While monitoring the different Mirai deployments, it became also obvious that this special actor had very special targets and interests. The victims were not just gamers playing call of duty, online dating websites or minecraft servers but mobile infrastructure inside Liberia. By then we knew that following Mufoscam.org, was following Botnet #14. Monitoring route updates inside Liberia was monitoring Mirai in action. 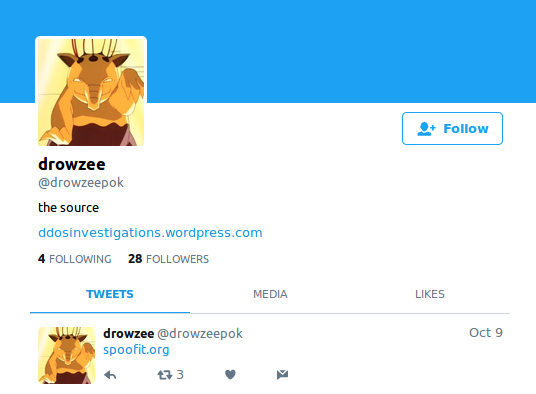 Thanks to the documents early released by drowzeepok and the analysis of hundreds of attacks launched by several stress testing services during the past couple of years, we understood that vdos-s.com backend (spoofing) servers were the common infrastructure used by many other “booters”, some of them also based in Israel and hosted in companies like Proginter.com and hidden behind Cloudflare. When Mirai started to attack a GSM operator in “Liberia”, we double checked again the VDOS leaked database, in the database we found records of a few interesting conversations between “bestbuy” and the VDOS support system back in late 2015. The support messages between bestbuy and the VDOS shows how Bestbuy wanted more powerful attacks from VDOS service against Liberia and he was willing to pay for them. No problem, feel free to contact us again if you need any further assistance. Each stress test is between 20-100+Gbps using DNS (depending on running stress tests), this information is included in our Terms of Service. May I ask why you require more power, 20-100Gbps should be enough to render most non-DDoS protected hosts offline. I cannot really assist you with this problem, sorry. If you provide me with an IP address and port, I will try to find a working method. I’ll give it another shot soon, thanks for checking! Yes, Just if you wonder: 41.57.89.17 is a Lonestar Cell address in Liberia. A close review of the VDOS leaked database reveals that several accounts created in the VDOS’s stress testing service were operated from a Cyprus IP address. Attacks started at least in late 2015 and have been ongoing until early 2017. In an article published in this site in late December 2016, we already linked Cyprus IP addresses to attacks against the GSM operator: Lonestar Cell. When Paras Jha (Anna-Senpai), felt the heat, he dumped the source code of Mirai in Hack Forums. This was not the first time that code of this nature has been dumped in the public domain. Qbot, a predecessor of Mirai also ended up in the Hacker Forum. For reasons we still ignore, the code released by Paras Jha included the string “VDOS” in one of the botnet components that suggests that a Mirai deployment was rented to VDOS. The new attack vector was connected to the domain tr069.pw as the TR069 attack vector was used to enlarge the number of machines compromised by Mirai. In preparation, Bestbuy provisioned two full networks to operate Mirai from Peterburg International Network aka PIN. The networks (5.188.232.0/24 and 5.8.65.0/24) were registered using the fake identity Bharath Kuchangi, BB9693-RIPE. bestbuy registered the networks using an email from the domain novotele.online. The details of Bharath Kuchangi were used to register Internet resources in RIPE where Peterburg International Network acted as a LIR proxy. Bharath Kuchangi identity was also used to obtain code-signing certificates. The data leak from Hacking Team shows that one of the certificates was in the name of Kuchangi. Bharath Kuchangi used the e-mail address fwd6ua@gmail.com in those certificates. The Mufoscam.org botnet (Botnet #14) has been moving to a myriad of ASNs. Following this botnet has been a fantastic way to find the best places in the Interwebs. Where has been Botnet #14? In alphabetical order. NL    AS62454  ZYZtm Research Division 10 B.V.
One of the most fascinating aspects of Bestbuy is his good understanding of the “Market Place”. What better way to be close to the market that operating the market? 10. Who is bestbuy? Why a mobile operator in Liberia? This morning, the Federal Criminal Police Office of Germany announced the detention of a suspect in Luton Airport in connection to Mirai and the attacks against Deutche Telecom. It seems that we might finally find out who bestbuy really is and why he targeted a place in Liberia. Stay tuned for more updates and to find out who Bill Bones is and what Peter Parker does in the Internet. As always, thanks for reaching out! Want to contribute? Reach out.